I swear my candy thermometer has gotten more of a workout this past week than in all of the past year! As I mentioned a couple days ago, I’m not making a whole lot of cookies this Christmas and have opted instead for candies, confections, and other treats for my treat boxes. 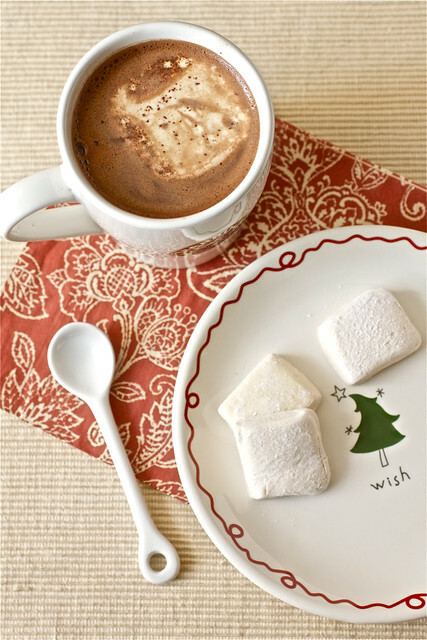 Hot chocolate mix and homemade marshmallows were the first items to go on my list and it wasn’t until Shawnda posted these Baileys marshmallows was I sold on a recipe. This was my first time making marshmallows for the sake of actually making marshmallows (i.e., not marshmallow filling in other recipes) and I’ve learned from this attempt that my mixer is more powerful than I thought. While the recipe instructs to beat the mixture for 15 on high, I think my mixture was finished at about 7 minutes because it only deflated from there, leaving me with semi-flat marshmallows. Regardless of how they looked, they tasted fabulous and if I wasn’t already a Baileys Irish Cream fan to begin with (which I was – yum! ), these marshmallows would have sealed the deal. The flavor of the Baileys really comes through since it isn’t cooked and the combination of the melted marshmallows in a mug of rich hot chocolate is certainly the perfect way to end a harried winter day. Dessert anyone? Place Baileys in the bowl of a stand mixer fitted with the whisk attachment and sprinkle gelatin over top. Stir the gelatin into the Baileys if it doesn’t all absorb within a few minutes. The mixture will be lumpy. In a medium sauce pan, heat sugar, corn syrup, salt, water, and vanilla over medium heat and stir constantly until the temperature reaches soft ball stage (240 degrees F) using a candy thermometer. With the mixer on low, slowly pour the heated sugar mixture in a slow, thin stream into the stand mixer bowl. Increase speed to high and whip for 7 to 15 minutes, until thickened and voluminous. Watch the mixture carefully and stop the mixer before it deflates. Spray an 8×8 pan with baking spray and coat with powdered sugar. Pour marshmallow mixture into the prepared pan and let sit at room temperature for at least 4 hours (overnight is fine). Dust a work surface with powdered sugar and turn the marshmallow out of the pan (pull up one of the corners of the marshmallow, flip, and let gravity do the rest). Using a greased pizza cutter or knife, cut the marshmallows into 1-inch squares, dusting the cut edges with powdered sugar to prevent sticking. Store the marshmallows in a gallon zip-top bag with a few additional spoonfuls of powdered sugar (shake the closed bag to evenly distribute the powdered sugar). Stored properly, the marshmallows will last 1-2 weeks. These sound wonderful! I was wondering though, for a kid friendly version of these, could you subsitute Bailey’s Irish Cream coffee creamer instead of the real deal? Thanks! I have yet to try making marshmallows…this version might be what it takes to get it done. I’m with you this year. Nary a cookie in sight but homemade liqueurs and more are lining my table for packaging! These sound amazing! I just tried Alton’s marshmallow recipe. I will certainly try it again with this addition of Baileys. Love Baileys around the holidays! I’m going to make these today! I’ll need a few batches, and it looks like you did too. Did you do any double batches in a 9×13? Or just do multiple batches in 8x8s? Laura: I only made a single batch so I can’t attest to the recipe doubling well. You might want to jump over to CoaFB and ask Shawnda – she may know. Sorry! mm, these look to die for! Happy holidays to you! Baileys and hot chocolate is my absolute favorite drink après-ski! 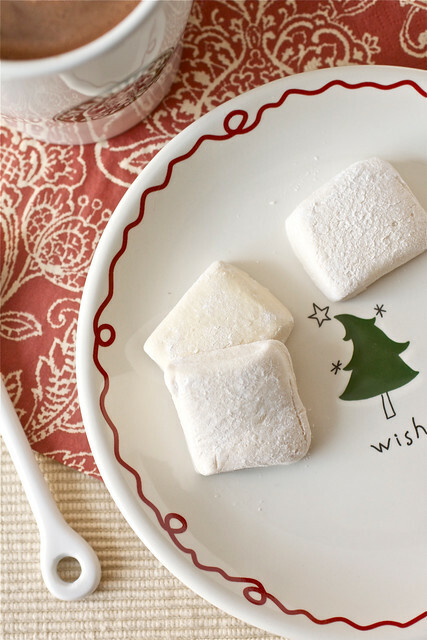 I made homemade marshmallows many years ago and had so much fun with them, but have not made them since. After seeing this recipe, I think it is time to give them another go! These sound amazing. I love bailey and cocoa. I will give them a try. I was given a gift of Jacques Torres Hot Cocoa so these sound like a great addition for the holiday. Thanks for the inspiration! I’m making these right now. Mine never got big and fluffy so I’m wondering if its the alcohol in the Baileys as I made none-alcoholic ones (just used water to soak the gelatin in) and they came very fluffy. It must be the alcohol because mine weren’t big and fluffy either – but amazingly delicious nonetheless. 🙂 Thanks for letting us know about the difference in consistency from your own experiences making them with and without alcohol! I was planning on making this with an old family recipe for Baileys (involving heavy cream and sweetened condensed milk). Do you know if it will still work, or does it rely on the preservatives from the store-bought Baileys to hold consistency? Also, since I will be mailing these as gifts, I was brainstorming on how to keep them: best idea so far being to vacuum seal and freeze. Will this ruin them?